Ayrshire Scotland Business News: Councils tell Secretary of State: Ayrshire matters! Councils tell Secretary of State: Ayrshire matters! Councillors Douglas Reid, Joe Cullinane and Douglas Campbell delivered the ‘Ayrshire matters’ message at their first joint meeting of 2018 and urged the Secretary of State to take the message back to his Westminster colleagues. 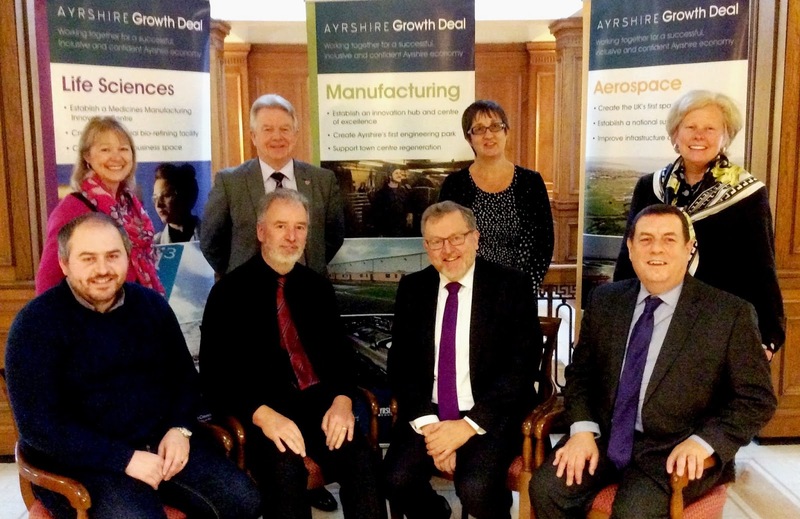 The purpose of the Ayrshire Growth Deal is to provide a focus for targeted investment – coordinated through a series of identified projects including aerospace, life sciences and manufacturing – that build on Ayrshire’s strengths, increase employment and prosperity and boost the economy at local, Scottish and UK levels. South Ayrshire Council Leader Councillor Douglas Campbell, who hosted the meeting at the Council’s headquarters in Ayr, said the meeting with the Secretary of State had been frank and constructive. He added: “As part of our wider efforts to boost economic growth, the Ayrshire Growth Deal has a vital role to play and the Secretary of State and his parliamentary colleagues have the power to make that happen. Councillor Douglas Reid, Leader of East Ayrshire Council, said: “Ayrshire is a great example of the invaluable contribution non-city regions can make to the national economy and we’re looking to the Secretary of State to help us turn our ambitions into a reality. It was particularly helpful to have the discussion with Mr Mundell the day after a very successful Business Breakfast in Kilmarnock where businesses across Ayrshire pledged their support for Ayrshire growth. Councillor Joe Cullinane added: “While we’re seeing progress in some of our Ayrshire Growth Deal projects, we do need the support of our government colleagues to allow us to get this transformational programme of work underway in a meaningful sense and that message was certainly made loud and clear to the Secretary of State.